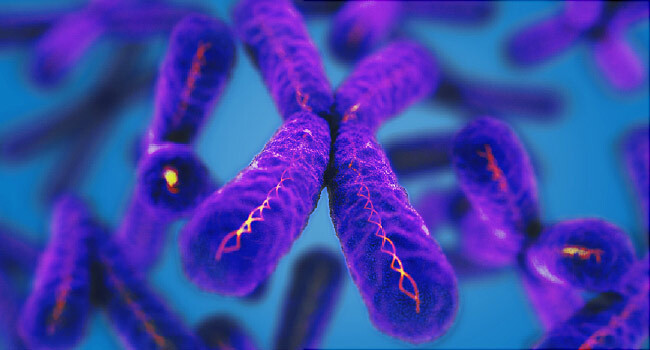 Telomeres are found at the end of chromosomes and represent the clock of a cell. A person is born with telomeres of a certain length, and every time a cell divides, it loses a little bit of the telomere. Once the telomere is too short, the cell cannot divide anymore, therefore, researchers are curious whether lengthening telomeres could slow aging, with many studies using a specialized enzyme called telomerase to fine-tune the biological clock. Now, a study from researchers at The Scripps Research Institute identifies a previously unknown protein which fine-tunes the cellular clock involved in aging. The team states their data shows that a novel protein, named TZAP (Telomeric Zinc finger-Associated Protein), binds the ends of chromosomes and determines how long telomeres, the segments of DNA which protect chromosome ends, can be. The study is published in the journal Science. Previous studies show that understanding telomere length is crucial because telomeres set the lifespan of cells in the body, dictating critical processes such as aging and the incidence of cancer. This cellular clock needs to be finely tuned to allow sufficient cell divisions to develop differentiated tissues and maintain renewable tissues in the body, and, at the same time, to limit the proliferation of cancerous cells. For the last few decades, the only proteins known to specifically bind telomeres is the telomerase enzyme and a protein complex known as the Shelterin complex. The current study shows that TZAP controls a process called telomere trimming, ensuring that telomeres do not become too long. The current study shows the reduced concentration of the shelterin complex at long telomeres results in TZAP binding and initiation of telomere trimming. Results shows that TZAP binding to long telomeres represents the switch which triggers telomere trimming, setting the upper limit of telomere length, which then allows cells to proliferate. Data findings show that TZAP binds preferentially to long telomeres which have a low concentration of shelterin complex, competing with the telomeric repeat binding factors TRF1 and TRF2. Results show that when localized at telomeres, TZAP triggers telomere trimming, a process which results in the rapid deletion of telomeric repeats. The team surmise that they have identified a previously unknown specific telomere-associated protein, named TZAP. For the future, the researchers propose a model for telomere length regulation in mammalian cells, namely, the reduced concentration of the shelterin complex at long telomeres results in TZAP binding and initiation of telomere trimming.